Home / Announcements / Cape Classics’ National Braai Day Contest! Cape Classics’ National Braai Day Contest! Starting tomorrow, Cape Classics, the USA’s largest importer of South African wines, is running a contest with a $500 prize! That prize will come by way of a Whole Foods gift card, and frankly, that’s groceries for a few months. It’s a good prize is what I’m saying, y’all. So what is this contest promoting? Boerewors over a braai fire / Photograph from braai.com. It’s part of Cape Classics’ campaign to bring awareness of South African culture to the US along with their food and drink. Braai, as you are likely learning along with myself in this moment, is barbecue! But more than that, it’s one of the oldest barbecue parties around. A variety of meats, from boerewors (sausages) to rock lobsters, are cooked over wood, though charcoal and gas are common in this day and age. Just like American barbecues or cook-outs, guests bring a dish to share and socialize for hours around that flame. It’s a time to celebrate, to fellowships with friends, to enjoy the smell of roasting foods to your heart’s delight. 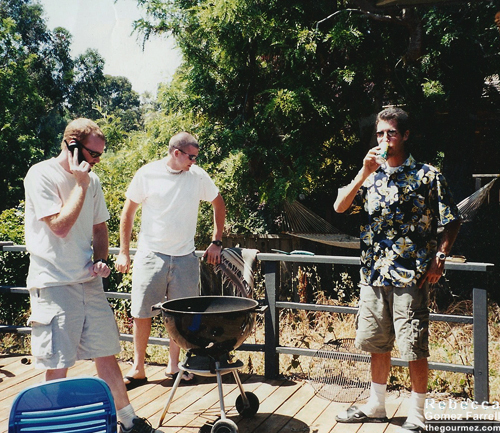 A group of my friends barbecuing on my deck, oh, 15 years ago in Santa Cruz. Americans, I think we’ve got this. And while we may usually have barbecues on Memorial Day, July 4th, and Labor Day, pretty much every holiday in South Africa is a day for braai — so much so that they gave it its own national holiday in 2005! 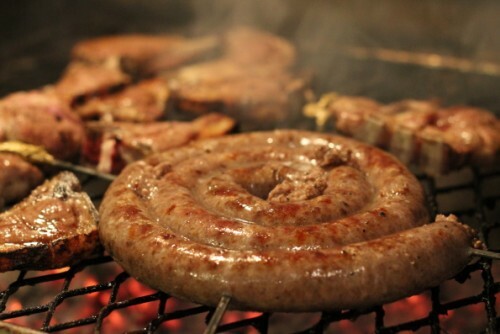 National Braai Day is celebrated as part of National Heritage Day on September 24 each year. And of course, what is a celebration without good drinks? South Africa has exceptional wines and Cape Classic is an importer of those wines. For this contest, they chose to highlight Indaba Wines, one of their oldest clients and a great example of sustainability practices and giving back to their employees. Sample bottles of Indaba are on their way to me, and I’ll try to get reviews of them up ASAP to help you decide what to pair with your braai selections. Do you follow me on Vivino yet? That’s where my on-the-fly reviews appear first. Update 9/23/15! You can now get my pairing suggestions for these Indaba Wines here. 1.. The contest takes place through Instagram, only. So if you haven’t signed up for Instagram and want to enter, get thee an account now! 3. That image must include a bottle of Indaba wine, must tag @IndabaWines (which means you need to follow them), and must include the hashtag #Braaigram. Where do you get Indaba wine? All over the place! Use the store locator here, but you can probably pick one up at your local BevMo or Cost Plus World Market. 4. You must be 21 years of age or older, legal drinking age in the US. 5. Your image must be posted between September 19, 2015, and September 28, 2015. I have absolutely no idea if I’ll be able to grill some meat in time to make the deadline, as my next two weeks are quite busy, but I’m going to try! Or maybe you want to invite me over to try yours? I’m ready to eat! 3 thoughts on : Cape Classics’ National Braai Day Contest! That is so cool. I was going to make boerewors sausage for my next Raleigh Cooks meetup. The theme is Food of the British Commonwealth. You will have to tell me how you make the sausages! I was wondering if I could find them around here.